Summary: This is one of the many new Direct to DVD animated movies being done for the DC Universe. Likely inspired by the Crisis on Infinite Earths concept, the story is about an alternate earth where the bad guys are good guys and vice verse. Story: The general story is that Lex Luthor from an alternate world, in which the Justice League there is comprised of villains, hops over to the world we all know and love to seek the aid of the resident Justice League. What was supposed to be a much more localized task, then becomes much more complicated with the creation of a bomb that could destroy all life on a planet. In the beginning I have some of my issues with the plot, such as the fact that Superman figures out that the new Lex that shows up is not the same one... because his heart is on the opposite side. Considering the fact that we very quickly learn that there are thousands of other worlds this little feature doesn't make much sense. But to be fair, this moves the story very quickly without too much padding. Because checking for this totally makes sense. Other issues include a plot point that includes a random ability to 'lock out' someone from a specific earth with just the transportation device itself. It seems a little unnecessary and only seems to serve the purpose of providing extra tension to a situation that is already pretty intense. Though my biggest issue without have to be the love side story with J'onn and the President's Daughter. 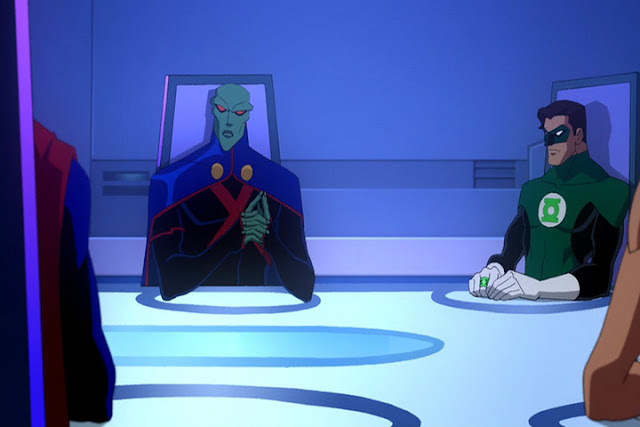 There were some very sweet moments, although a bit forced, and pleasant all around to see J'onn connect with someone romantically. However, at the end he simply leaves her there. That entire set up was all for nothing and a weak joke; it was highly disappointing. Characters: We first have your basic Justice League cast of Batman, J'onn J'onzz, Wonder Woman, Green Lanturn, the Flash and Superman. Most of their designs are pretty basic and un-changed except for J'onn's that appears to be greatly different from his other versions. 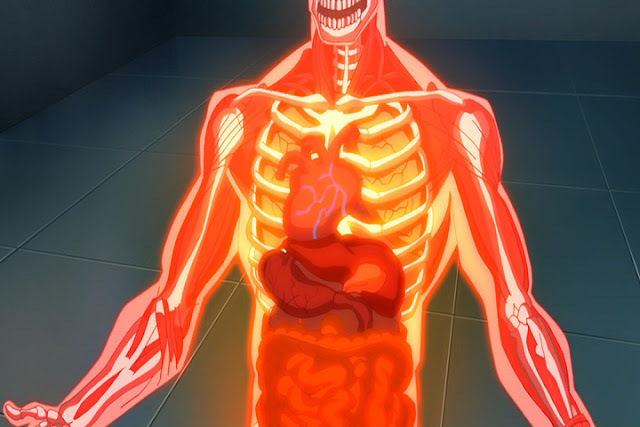 Everything from his face to his costume and even original form appear somewhat unique. To be honest, I think I prefer this costume to all the others I've seen, it makes it look more like uniform, rather than something with ridiculous crisscross suspenders with blue bloomers. 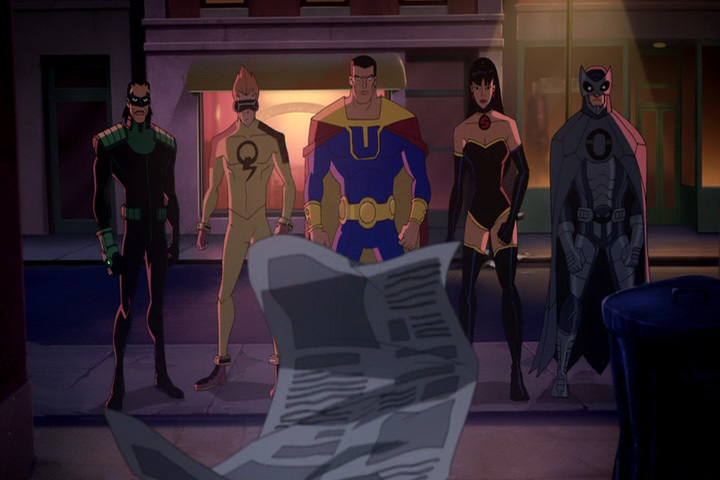 On our alternate earth, we have the 'Crime Syndicate' which include alternates of our Heroes. Ultraman is the alternate to Superman with bold blue and yellow colors and a U symbol on his chest. (anyone else getting 40K flashbacks?) There isn't much to say about his character, other than being brash and greedy. Superwoman is the alternate of Wonder Woman, with a very simplistic black and gold motif with a small red S on her neck. I like her look the best as it really feels classy. I also really loved her voice actor, Gina Torres, who was Vixen in the Justice League Unlimited series. She also seems to be the most developed of our Evil Counterparts, aside from Owlman. Speaking of, Owlman is the alternate of Batman. Even though he wore the typical black, his appearance is greatly different from Batman. One of the most noticeable parts is his sloping shoulder-line which is a huge contrast to the other typical hero structures, and makes him seem less threatening. I think it was a good direction to take the character, as it made his moments of combat even more surprising. He gets the most talk time of the alter egos, apart from Superwoman. Johnny Quick, alternate of the Flash wears a gaudy yellow suite with tall red hair and has an Australian accent. Very little in the way of character development is done with him. The Green Lantern's alternate barely speaks, and J'onn's counterpart gets killed in the beginning of the movie. Lex Luthor was rather enjoyable in this series as well, and even appeared surprisingly Genre Savvy. Design wise, he looks pretty much like the Lex from the JLU series, and his suit is pretty much the same looking as well. Voice Acting: Nice performances overall, though Green Lantern, voiced by Nolan North felt a bit dry in some of his execution. Mark Harmon just wasn't making me feel Superman actually cared about anything. And, even though I keep expecting to hear the voice of Kevin Conroy when Batman begins to speak, William Baldwin still did a great job with the character. Though, I think some of the best of the movie were Gina Torres's Superwoman and James Wood's Owlman. But then again, would you expect any less from Hades? Soundtrack: The movie itself has an overall good score. However, the part that stands out to me the most is the title track. It's a very powerful and beautiful track, appropriately 'epic' for the movie itself. The rest of the mood and atmospheric music is well done. Quality and Style: The look of the movie bears a resemblance to the Bruce Timm versions of the Justice League, but with more definition. It's a look that works great for the movie and helps draw in people like me, that very much enjoyed the 'Timmverse' of cartoons. The animation quality itself is great, there's a lot of subtle motion in character actions that give them more life. The action scenes are also fluid and easy to follow, sometimes giving us full fights with very few cut-aways. I also have to add here that I found the opening title to be very fun. Conclusion: The movie itself was just great, aside from nitpicks, though it's those nitpicks that keep it from being Phenomenal. It is something that is enjoyable to watch for any fans of the DCU. Even I felt like watching it a second time after watching it first, this does not happen very often. It also makes me glad to see a movie like this take itself seriously, and it really does feel like the whole team cared about what they were doing. Maybe we will see better use of the Animation medium yet.